A note on JIS screwdrivers: You should not try to remove crosshead screws with a Phillips head screwdriver. The slots will strip. The most common place you’ll find these is on your engine covers. These screws and other screws like them should only be removed with Japanese Industrial Standard (JIS) bits. Phillips head driver bits are too long and pointed for the JIS crosshead slots and will cause the JIS slots to strip and break when they are tightened. If you look at the screws on your old motorcycles, specifically the ones that attach the engine cover, you’ll find that many of the slots are stripped out. This is often because the wrong type of screwdriver was use to remove or install the screws. While they may look like a standard, Phillips head screw, most screws on your bike will need to take JIS bits. If you try to use a Phillips bit on a JIS slotted screw, especially screws that are stuck, you’ll likely strip the threads. JIS bits will fit snuggly into the screw’s slots. Phillips bits will easily cam-out when you turn them. 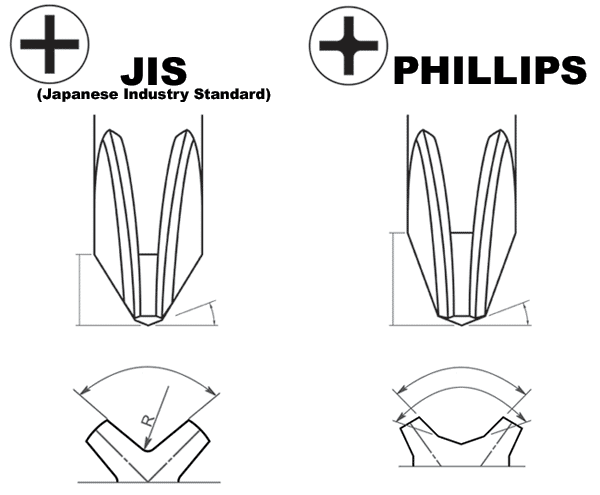 A quick side-by-side comparison will show that Phillips bits are a bit longer and more narrow at the end compared to JIS bits. To avoid rounding out your screw heads, be sure to use the correct bits. You can either buy a set a JIS screwdrivers and bits for your impact driver, or you can make your own by grinding down Phillips bits. This is a good addition to your standard tool kit. Use a grinder tool to grind down the tip of the Phillips head bit. Take off a little bit at a time and test its fitment in the JIS slots. Stop grinding when there is no more movement/wiggle room between the ground Phillips bit and the JIS slot. During the rebuild you can usually replace all the JIS cover screws with Allen head screw kits from suppliers like z1 enterprises.